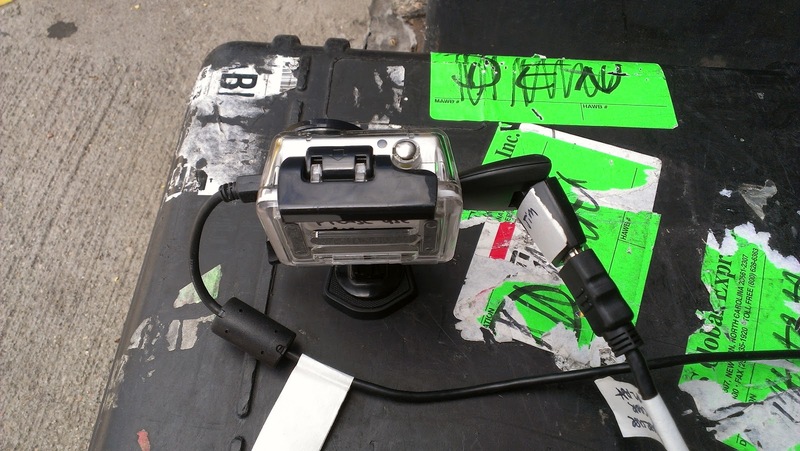 There is becoming an increasing use of GoPro HD cameras in the broadcast setting. They are cheap ($300), they are small and can be put in places that regular broadcast cameras can't go and the look pretty good when mixed in with other professional HD cameras in a broadcast - especially with the wide angle lens they come with. However, there are a number of issues we have discovered in making these work in a broadcast setting. 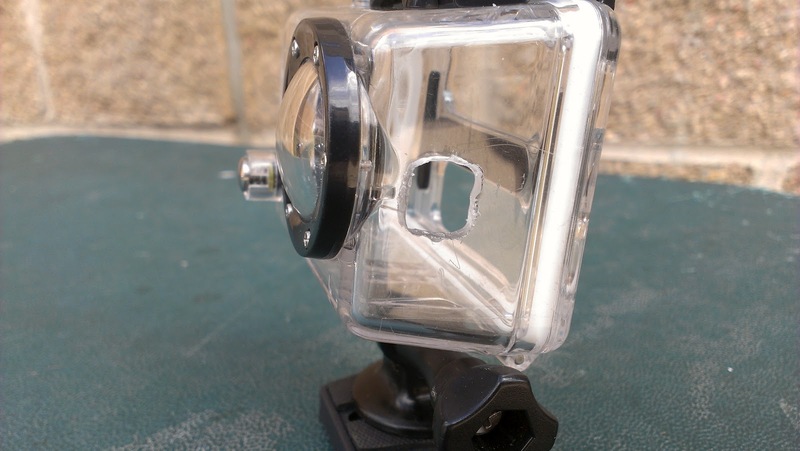 for starters, read this great article written by veteran video professional Tom Guilmette about using the older GoPro's with CBS basketball. He has some very valuable information. 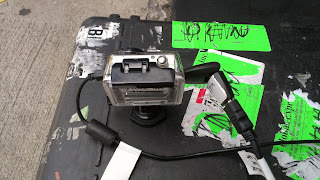 In this article, I am going to focus on the newer GoPro HD Hero2 and our experience on Colorado Rockies Baseball on Root Sports. Thanks to my fellow tech managers for the hours of work that have been put in researching, testing and trouble shooting this camera. GoPro HD Hero 2 camera in a modified waterproof case (needs modification to get HDMI and USB cables to work). 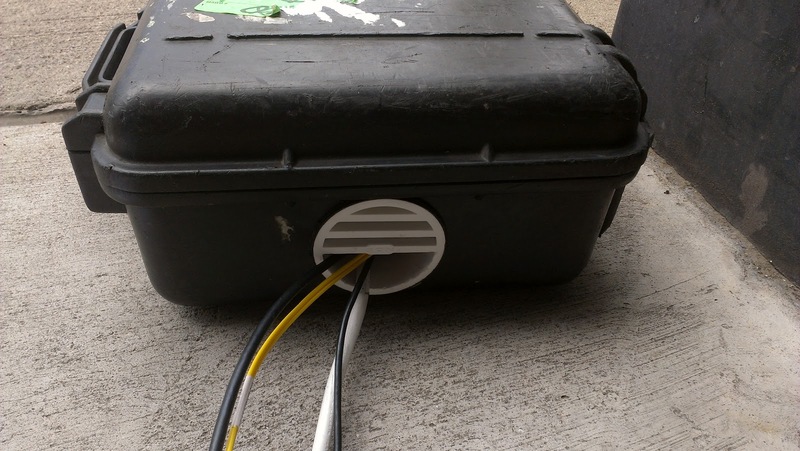 Our director used a Dremel tool to create access ports in the case. Remember to make them big enough to get the entire connector housing in. Note the angled mini-HDMI to HDMI adapter. Very helpful and lets you use standard HDMI cable runs. As Tom's article points out, power with these devices is finicky. Follow his advice. Start out with a full battery in the GoPro before starting to hook up HDMI and use it as a live camera. The battery heats up very quickly when it is being charged under load and you quickly get the "heat problem" described below. 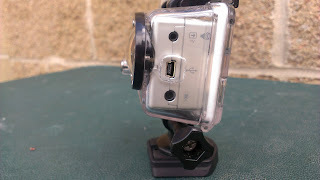 Turn on the camera without the USB cable attached and then plug in the USB cable once the camera is powered up. Does not matter if HDMI is plugged in at this time. Do not use a standard cell phone charger with these cameras. Most cell phone chargers output around 500mA (mili-amps) of power. While this may charge the battery while the camera is off, it is not enough power to run the camera while under load. We are currently a 1.2 Amp USB power adapter. Ours happens to be a Sierra Wireless power supply. We are going to upgrade to a 10 watt (1.9 Amp) adapter. Check the specs on the power supply. You need the 5.2V variety and more amps are better here. I would not go below one rated at 1.5 Amps. Get a longer USB cable. You need one with a Mini-B 5 pin type on one end and a standard USB male on the other end. MonoPrice makes some at very good pricing. I would be cautious on going too long with your USB cable - especially with lower rated power adapters. Like in video, length = loss with power cables. Also, remember to get an HDMI cable the same length as your USB! These cameras hate heat. In our experience, as soon as they get hot, they shut down and stop working until they are cooled. Because our camera is set up outside near some fountains, it is in the waterproof case that comes with the camera. This case, by design, has very limited natural air flow around the camera and adds to how fast it heats up. Your mileage may vary by not using this case. For night games in our outdoor stadium, the camera tends to work pretty well. We make an effort to turn it on as late in the day as possible. For day games, if the camera is in the sun and ambient temps are in the upper 80's, we get a couple hours of use out of the camera before it shuts down - and when it shuts down, you have to pull the battery to reset and cool it down first. If it's sunny and the camera is going to be in the sun at all, it does not seem to work. We loose access to the camera once the game begins so when it's gone, it's gone. If you are inside a stadium, especially if you are not using the waterproof case, you may get better results but keep the heat problem in mind when picking your placement. We have a medium sized Pelican case (no foam) that we use to house a power strip, the Tx side of the Rattler and the AJA HA5. 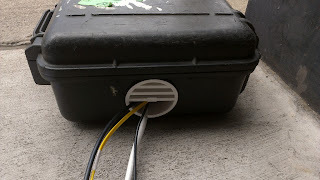 All cables run into the box. This equipment also gets very hot. We are looking to add a small muffin fan to the box to help keep the equipment cooler. 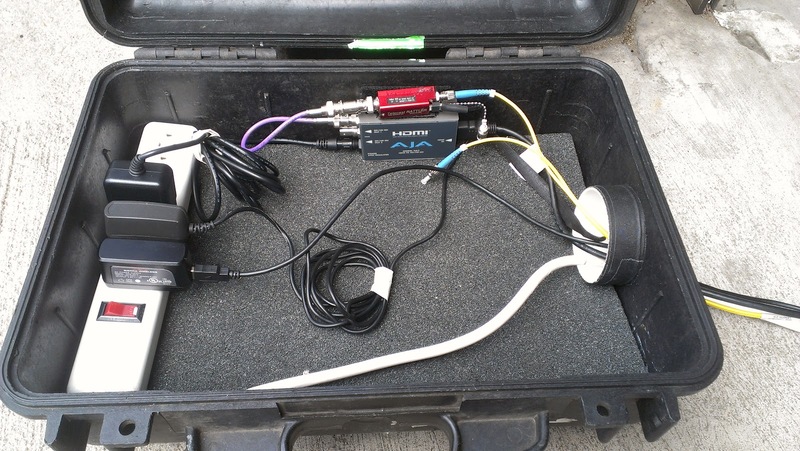 We like the case since it keeps everything neat and provides some environmental protection to the equipment (since it is sitting near a fountain outside). Pelican case with the equipment mounted in. Also makes a great carrying case for the camera and cables as well. We are looking into putting a fan into this case as well to help with heat. Please feel free to post any comments here with your findings or questions. It looks like the use of these cameras is only going to be increasing over the next few years. No sense in all of us trying to figure out the same problems. Good info! I am wondering...the hero can be installed with a monitor and Go Pro makes a case that will house both camera and monitor. If that case was used without the monitor instead of the original...maybe it would provide some air movement and help keep it cooler? I would love to connect 10 go pros to my tricaster or Wirecast. Wirelessly is it possible?